So you want to unlock your iPhone 4? Well a promise was made by the iPhone dev team that they were going to release the information to unlock the iPhone 4, and needless to say, they have been true to their word and delivered, just and they promised, such information. So by following these few simple steps, your iPhone will be unlock in just a matter of minutes. First, you must make sure that your iPhone is connected to a Wi-Fi network. 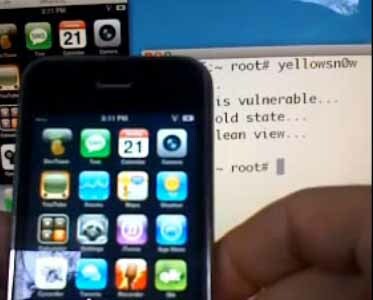 Now, in order to unlock, your iPhone must be jailbroken on the latest firmware 3.1.3 to 4.0. If it’s not, then to be sure, you must open your “Safari” browser on your iPhone, go to http://jailbreakme.com and “Slide to Jailbreak” to begin the process. Wait patiently for the jailbreak tool to download the needed files. Once the download is complete, the jailbreak process will then automatically begin. At that point, all you will have to do is not touch anything and wait until it is complete. After completion, you will be greeted with an alert message stating “Cydia was added to the home screen.” Close and go to Cydia. Once at Cydia, go to the search tab and type in, “ultrasn0w”. If you already have this updated to version 1.0.1or higher there is no need for you to go on with the remaining steps. What you would want to do next is hit the install button to add ultrasn0w. This final step should unlock the phone however it will not unlock if the unltrasn0w version less than 1.0.1. If you do not have this version, then at the bottom of the screen there should be a tab stating “Manage.” Select the tab and then touch the “Sources” tab. Once this is done, then proceed to selecting the “Edit” button and then “Add” and type in http://repo666.ultrasn0w.com. Hit the “Add Source” tab to add this repo. After that is done, reboot you’re your phone and go into Cydia once again, head to the search tab and type in “ultrasn0w” again and it should be updated to a 1.0.1 version of ultrasn0w or higher now. Touch the install button to install and your phone should now be unlocked. Well, there you have it people, a few easy steps which allowed you to unlock your phone in a matter of minutes. So enjoy and be entertained with your new iPhone 4.